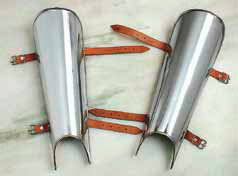 Our Plain Iron Greaves Lower Leg Armour are a simple form of leg protection. These plain greaves are suitable for many historic periods from Roman to Renaissance. Our version, measuring 13 1/2" from ankle up, is made of solid thick iron with rolled edges. They also contain thick leather straps with buckles for adjustable fit. This page was last modified on 12 May 2014, at 17:37.